1) There are many ways you can mount a fender, this is just one of them. 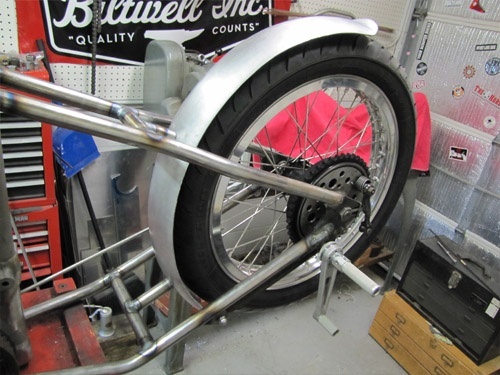 I wanted to make strong mounts as the .125" aluminum fender needs to support the weight of a passenger as that is where the rider sits on this purpose-built race bike. 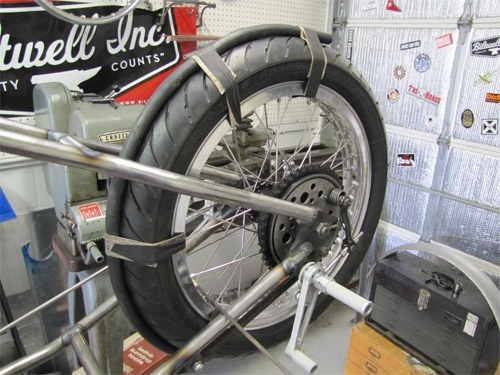 2) I set the fender onto the tire after radiusing it to fit just right (see the How To Radius a Motorcycle Fender DIY Tech Tip). 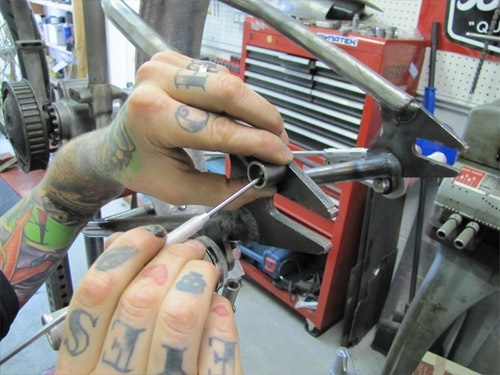 I then cut a piece of 1" tubing, the same .120 wall DOM tubing used to make the hardtail, and coped one end of it to fit onto the existing cross member. 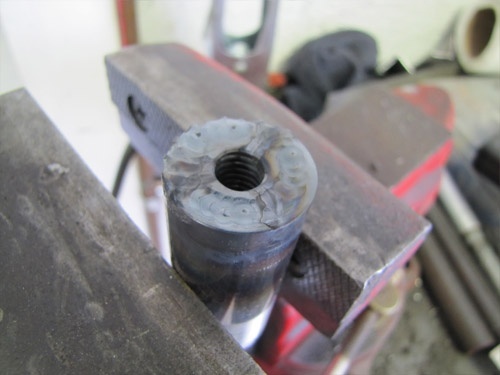 I did this a simple, quick and dirty way by clamping the tubing in a vice and drilling through it with a 1" step bit. 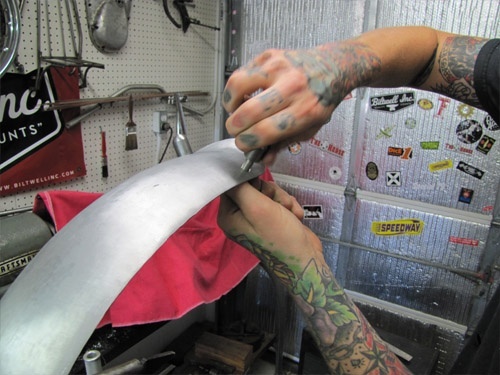 I then cut it to the proper length to be a tight fit against the fender. 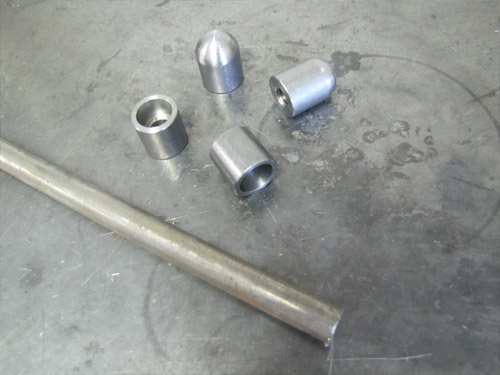 3) I took a hair off the length at a time using a lathe, but you can use a grinder to get it in the ballpark then use a hand file to get the proper length. 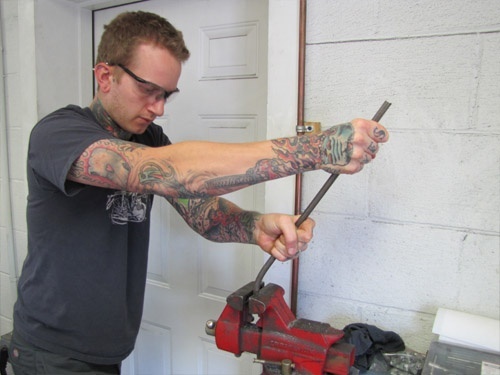 I then used a threaded bung with a .75" outside diameter that was tapped and threaded for a 3/8"-16 bolt and chamfered the edge of it. 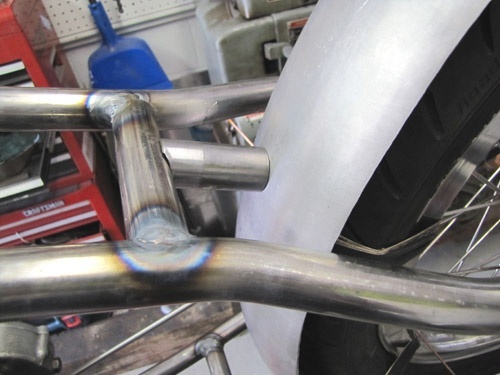 4) The bung is a nice sliding fit into the tubing, and I then TIG welded it up, just fusing it with no filler rod. You can also MIG weld it up, of course. The benefit of having a lathe once again reared it's head as I chucked the piece back up and faced it, taking off just enough material to give a nice finished surface. 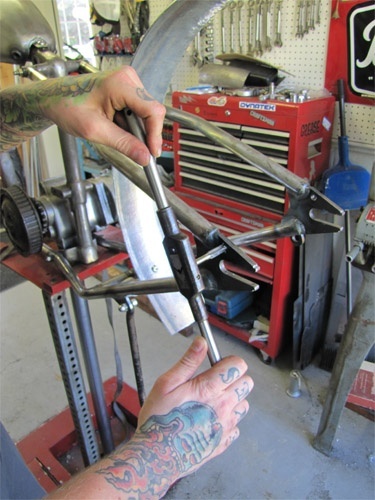 5) Once you tack your first fender support in place, you can carefully mark and drill your fender and bolt it in place. 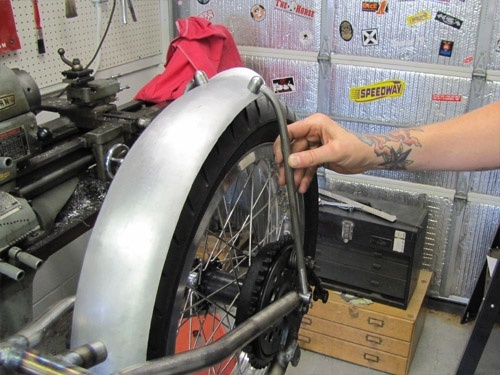 Then follow the same steps to fabricate your bottom mount, again carefully lining up the fender before drilling. Now all that is left to do is make some fender struts to finish the sturdy mounting of our fender. 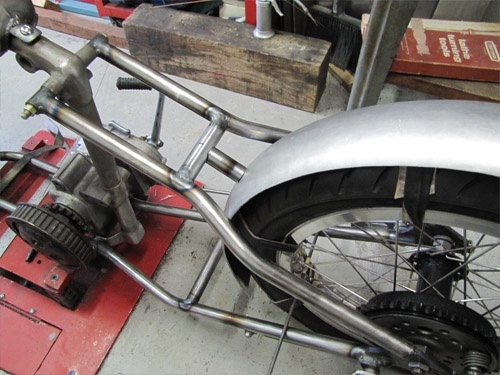 6) Now that the fender is securely mounting at the top and bottom hardtail cross-members, we need to fabricate some struts or a sissy bar that will hold up the rear of the fender. To do this I chose some 1/2" diameter cold rolled round stock. I also used some full radius 3/8"-16 threaded bungs and some counterbore bungs that accept a 3/8" allen head bolt, keeping the head flush mounted for a clean look. We now have a DIY Fender Strut Kit available containing all of this as well as stainless steel hardware. 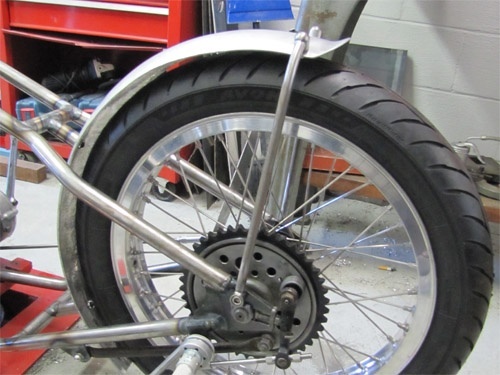 7) It is easier to mount your bungs to your fender and frame and bend the steel rod to fit, so I went ahead and drilled some 3/8" holes in my fender and bolted the full radius bungs to it. 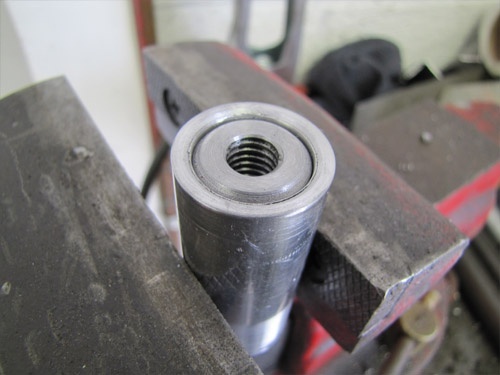 9) Now that I had my upper and lower mounts all bolted in place I cut a piece of the 1/2" steel rod several inches longer than necessary and used our state-of-the-art bender to get a nice curve so the strut would meet the top fender bung nicely. 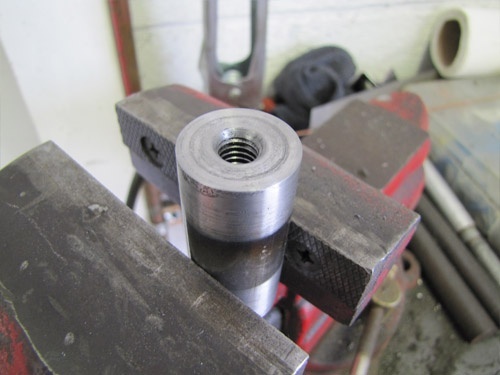 10) After getting a nice bend to it, I cut the strut to the proper length and filed it to be a nice tight fit before tacking it in place and then doing the finish welding. 11) The finished struts turned out great and only took a couple hours from start to finish. Nice and sturdy, they are able to support a passenger on the fender with no problem. The biggest thing with a project like this is taking your time, the second strut takes a little more time to make it match up perfectly to the first.